The Phillies have been hot at home, but much cooler on the road. The defending National League champions haven't won a series away from Citizens Bank Park since June 15-17 at Yankee Stadium. Philadelphia (57-48) hopes to win their first road series opener since a series in Florida that began on May 28th. The Phillies will send the ace, Roy Halladay, to the mound. Halladay threw a perfect game the last time he pitched in Miami. The Marlins (53-52) will counter with lefty Sean West, who will be making his first start of the season. 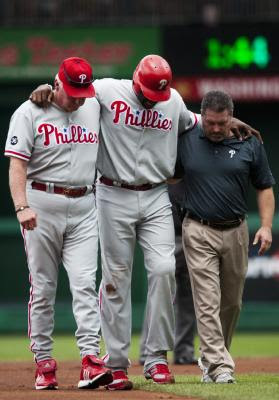 Ryan Howard, who injured his ankle in the first inning of Sunday's contest against the Nationals, has returned to Philadelphia to be further examined by team physicians. He is expected to miss some time, but whether he spends time on the disabled list remains to be seen. Tuesday, 7:10pm. Roy Halladay (12-8, 2.21 ERA) vs. Sean West (N/A). Halladay is 2-2 with a 2.12 ERA in 5 career starts against the Marlins. In 9 road starts this season, Halladay is 4-4 with a 3.07 ERA. Cody Ross is 2-for-13 (.154 avg) in his career against Halladay. West started 20 games for Florida and posted an 8-6 record and a 4.79 ERA in 2009. West was 4-3 with a 3.12 ERA for Triple A New Orleans this season. Wednesday, 7:10pm. Kyle Kendrick (6-4, 4.44 ERA) vs. Anibal Sanchez (8-6, 3.33 ERA). In 11 games against the Marlins, Kendrick has a 3-2 record with a 5.83 ERA. In his last 5 starts, Kendrick has posted a 3.44 ERA. Sanchez is 3-5 with a 4.93 ERA in 9 starts against the Phillies in his career. In 10 home starts this season, Sanchez has posted a 3-2 record with a 2.60 ERA. In his past 5 outings, Sanchez is 1-2 with a 3.77 ERA. Thursday, 7:10pm. Roy Oswalt (6-13, 3.53 ERA) vs. Chris Volstad (5-8, 4.71 ERA). Oswalt allowed 4 earned runs over 6 innings against the Nationals in his debut with the Phillies, taking the loss. In his last 5 starts, Oswalt is 1-3 with a 3.48 ERA. Hanley Ramirez is 10-for-22 (.455 avg) with 3 doubles and 2 homers against Oswalt in his career. In 10 home starts this season, Volstad is 2-4 with a 3.65 ERA. In 2 starts against the Phillies this year, Volstad is 0-1 with a 6.97 ERA. Ryan Howard is 9-for-20 (.450 avg) with 5 homeruns against Volstad. Jayson Werth is a combined 3-for-32 (.094) in his career against West, Sanchez and Volstad. Placido Polanco leads the Phils with a .317 batting average this season, but in 5 games against the Marlins, he has posted a .190 batting average. Polanco is batting .337 against right-handed pitchers this season. In 78 games against the Phils, Dan Uggla is a .233 hitter. At home this season, Uggla is hitting .250 while he has posted a .302 average on the road. In 13 games against the Phillies, Leo Nunez is 7-for-7 in save opportunities with a 2.03 ERA.